The implement pictured here is a piece of office equipment from the not-so-distant past. While it looks like it could have been used to convince tardy clients to settle their legal bills, its main purpose was to copy letters. This was the leading technology of the reprographic world for 150 years. We strive for the "paperless office" now, but nineteenth century businesses were small and paperwork was minimal. The volume of correspondence was low. Letters were handwritten and copies were made by hand, a task which, in many law offices, became the main purpose of articling students. Copies of outgoing correspondence were either bound chronologically or were made directly in blank bound volumes. One could find the letters by searching by date or using the index at the beginning or at the end of the book. The copy press was invented in the late 1700s but was not in general use in offices until the development of better inks in the second half of the nineteenth century. The new process required the paper in copy books to be replaced with tissue paper. The copyist inserted the letter to be copied under one of the thin, moistened pages. Sheets of oiled paper were placed before the tissue page and after the letter to protect the rest of the book from moisture. The book was then closed and put in the press. The special ink of the letter quickly migrated to the damp tissue, creating a perfect, if reversed, image of the original that could be read through the tissue paper. This process could only be carried out within the first 24 hours of writing the original letter. The process may seem cumbersome, messy and restrictive, but it was considerably faster than hand copying and allowed the simultaneous reproduction of multiple letters. It shifted the burden of copying from skilled staff to office boys, and, since the copies were facsimiles of the original, the risk of copying errors was eliminated. The birth of the railways and other large organizations, the invention of the telegraph, and then of the telephone increased the need for paperwork. The means to produce it, reproduce it and manage it had to change. Writing and making one, perhaps two copies of letters at a time was inconvenient. Having to store incoming and outgoing documents separately was not efficient. The invention of the typewriter alone did not displace the copy press. Many companies continued to copy typewritten letters with a press and stored them in letter books. In fact, the technique was so reliable that it was used by smaller companies well into the twentieth century. The overthrow of the press was precipitated by the combined use of the typewriter and an early 1800s invention: carbon paper. Before the typewriter, the pressure required for carbon copying either broke the tip of writing implements or else it ripped the carbon sheet. The typewriter changed all that. The new process allowed the production of many copies at the same time, on regular paper, a boon for large and geographically dispersed companies such as the railways. Eventually it became cheaper and less labour intensive than the press, which was retired, first in large offices, then in smaller workplaces. 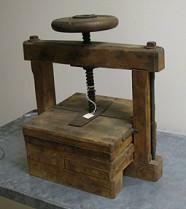 The copy press illustrated in the article was a gift from the estate of Stanley C. Biggs, QC, LSM, L.L.B, J.D.